Tracing my Italian roots has been difficult to say the least, especially when it comes to name changes or my ancestors names being misspelled. However, I was stumped with a new mystery when I came across three separate passenger lists that listed my 2nd great grand father, Andrea Cautilli. At first, I figured it must just be multiple men with the same or a similar name but the more I examined and cross referenced the documents I realized all three were in fact records of Andrea’s travels. On March 22, 1897, “Andria Cantilli” arrived in New York, New York on La Champagne, having departed from Havre. My 2nd great grandfather was only 27 years old when he arrived in the United States with his brother “Sevidio” (Cesidio Cautilli), age 30. Andria, whose occupation was listed as a workman, brought with him only one bag of luggage. In this 1st document, a couple of details stood out. I knew that my great grand father, Andrea was from Italy and I knew he had an older brother named Cesidio. Although I knew Andrea and Cesidio’s names where spelt incorrectly on this document, I knew this was a common problem in records concerning Italian immigrants and assumed there was a good chance that this was my 2nd great grandfather and his brother. “Andrea Cantilli”, who was from San Donato in Southern Italy, sailed from Naples on the S.S. Cambroman and landed in Boston, Massachusetts on July 1, 1902. At the age of 32 he paid his way to the United States, landing in Boston with only $24.00 in his pocket. This document listed him as married, able to read and write, working as a stonecutter and mentioned that he had been in the United States before, from 1897-1900. Along with this information, the document provided a few other strange details, including the fact that he was not a Polygamist, that he was in good metal and physical health and was not deformed or crippled. In Boston, Andrea planned to stay with his friend, Carmine Cantilli. This document, paired with the first passenger list provided a few more details and helped confirm that the two documents were pertaining to the same person. First of all, I grew up hearing about my family being from San Donato, Italy-that checked out. 2nd, although it lists Andrea as staying with a friend in Boston, I knew my great grandfather had a brother named Carmine Cautilli. Another thing that got my interest was that I knew Andrea’s son, my great grandfather Abramo was a stonecutter-did Abramo follow in his father’s footsteps? Finally, this record confirmed that Andrea had also traveled to the Untied States in 1897, which helped link the first and second passenger lists to the the same man. On April 22, 1909, Andrea Cautilli sailed from Naples, Italy on the S.S. Cauopic and arrived in Boston, Massachusetts. Andrea was from Southern Italy, in Caserta, San Donato. Listed as his “nearest relative or friend” in Italy is his wife, Angela who lived in San Donato. Andrea was 39 years old, working as a stonecutter, was able to read and write and was headed for his final destination in West Quincy, Massachusetts. This third passenger list continued to make sense of the previous two. It also gave me a more specific location as to where my family was from in Italy and even mentioned my 2nd great grandmother, whose name was Angela. Finally, it mentioned Quincy, Massachusetts-the location my Cautilli family settled. Once I went through these three documents, cross examined the information and determined that they all were referring to the same man I couldn’t help but wonder, why did he travel to the United States three separate times? During that time it wasn’t a quick seven to eight hour flight over the Atlantic Ocean… it was at least two miserable weeks trapped on a boat. Not to mention-how the hell was he able to afford the multiple trips? After hours of crazy (but fun) outlandish guesses, I decided to do a search on Italian Immigration in the late 1800’s to early 1900’s. Stepping back to take a look at Italian history around the time my 2nd great grandfather left provided me with some answers regarding his several trips. In fact, it was not uncommon for Italian men to make several journeys to the Untied States during that time period, they were even referred to as “Birds of Passage”. So what made these Italian men flock to the United States? From 1876 through 1976 Italy suffered from political, economical and environmental troubles. During this time period Italy was made up of several different states that were all busy fighting each other. In 1860 they were faced with a 10-year civil war, which lead to one million people being slaughtered by the Italian Army of occupation. From what I read, a majority of those targeted were southern Italians… where my family was from. Following the war, Italy (especially southern) was confronted with an extreme economic depression. The northern Italians who basically ran the government took the opportunity to over tax the southern Italians into poverty. To make matters worse, there was a lack of natural resources, which lead to little to no industry. To add to the destruction following the war, political corruption and weak economy Italy was hit with a series of natural disasters. There were two volcanoes that erupted burying entire towns and an earthquake in 1908, which killed 100,000 people from the tsunami that followed. Needless to say southern Italy was a mess when men decided to leave their families (parents or spouses and children) to look for work in America. The plan however was never to stay here, it was to come to the United States to make money during the busy work months to send home to their families and then return home once the work season came to an end. This earned them the name, “Birds of Passage”. This trip across the sea in search of work became a common thing, part of growing up. They were trying to make life for their families back home better AND life in Italy better by getting temporary work here. Once these men made enough to live comfortably in Italy they would return home and stay there while others, after several trips, decided to stay here and become citizens. From the sounds of it, my 2nd great grandfather Andrea and his brothers were “Birds of Passage”. His final trip to the United States would have happened just a year after the 1908 earthquake. 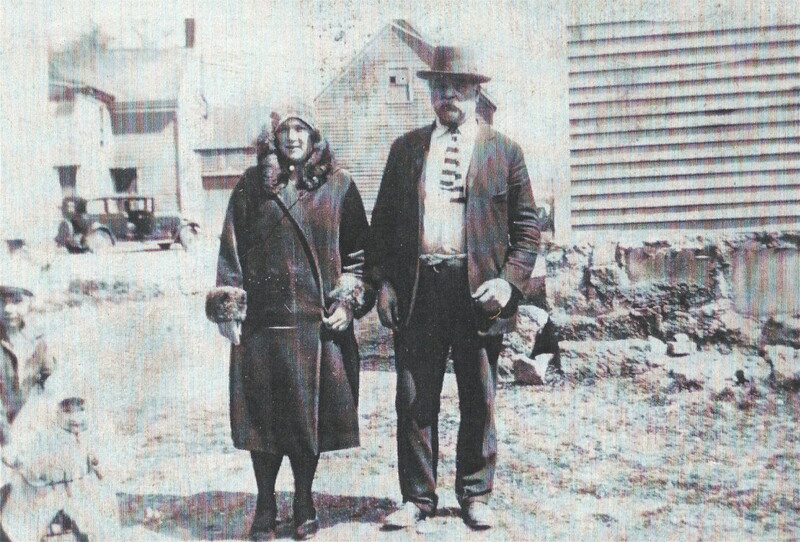 Once he got settled in Quincy, Massachusetts he sent for his wife and three sons to come over in 1910. Why did he decide to change his plans and make the US his home? That is something I will never know the exact reason for. However, with a little research into Italy’s history I am able to come up with a basic understanding of factors that probably played a part in his decision. This is also an excellent example of what I love about genealogy-it gives us an awareness and appreciation for the very personal touch past events played in our very own existence. Nicely researched and written, Kris! It is so interesting and fulfilling to learn about one’s ancestry and heritage. This was so interesting to read. I’ve always been interested in learning about my ancestors too. Last summer, I sat down and drew out a family tree as I uncovered the names of five generations before mine by jogging my mother and father’s memory. I know my mom’s side has roots from Sicily, and my dad’s from Castelpatrosa (he moved here with my grandparents and aunts when he was 4). Reading this post has made me eager to dig deeper and discover more about my ancestors. I’ve also always been curious to find out if I have any roots outside Italy. So far the only surname I know in my family tree that is not Italian is German I believe, with the name Fineburg. My family tree as far as I know is dominated by Italians: Cicchino, Cozzo, Forte (as a musician I find this one particularly cool 🙂 ), Easparro, Alfieri, Vacca, and Cutrone. It was especially intrigued when I discovered my Poppy (mother’s father)’s original surname was Fineburg, but his father left and he took on his mother’s name Cozzo. So somewhere is a long line of Germans that I’d like to uncover more about. Discovering Fineberg also has me wondering if down the line other surnames were lost or intentionally forgotten in a similar manner. Where would you recommend looking next. My dad tried Ancestry.com at one point, but didn’t find anything. I find this all so interesting, because when I learn about my ancestors, I feel as though I’m discovering a deeper part if myself, and it’s all just so fascinating and humbling to think that every life in this world is so colorful and detailed, and how there are so many lives tmif people who lived, breathed, and survived to oneday many centuries later give life to us in the present day. So thank you for sharing your family’s story and posting this. I originally heard of you from Ghost Hunters, since I’ve been intrigued by the supernatural since I was a kid. I’m primarily a musician and songwriter with some drawing and sketching as a side hobby/ creative outlet, but this type of historical research really intrests me. You seem to be good at uncovering information on family trees, and if you have any tips or recommendations to help me get a start on researching my family’s past as well, I would be so grateful. Thank you for being an inspiration. 🙂 Namaste.